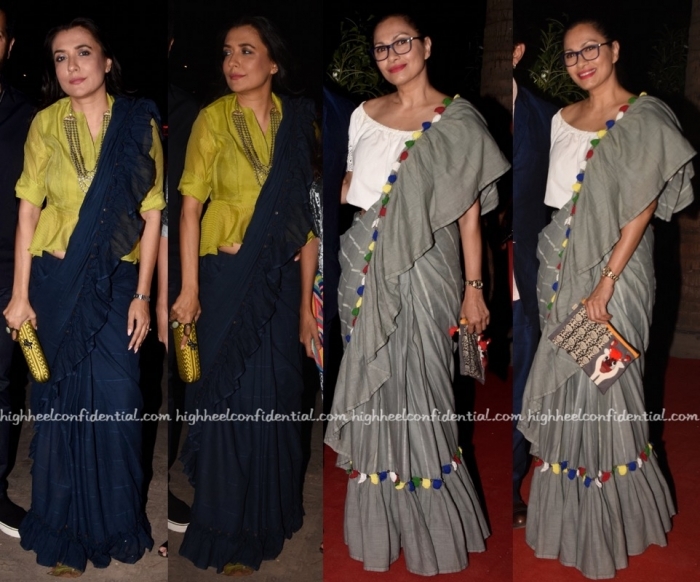 Wearing saris with ruffle-detail, Mini and Maria attended MAMI opening night event and later, the after-party. Both ladies rounded out their look with matching clutches. At the MAMI after-party last evening, Rakul Preet was photographed in floral separates by Smriti Jhunjhunwala. Wearing her hair back, she rounded out the look with pair of black Aldo pumps. Print-on-print when done well works. That however wasn’t the case here. The whole look seemed rather dowdy on Ms. Singh. While at a soirée last evening, Swara was photographed in separates by Ode to Odd. Wearing her hair down, she rounded out the look with jewelry from Diai Designs and pair of black pumps. Navy looks great on most skin-tones and this was no exception either. But I really can’t get past the pants… Once you see the crotch-detail, it’s hard to un-see it. Odd indeed. Tisca was spotted at the MAMI after party wearing a silk blouse from the Gucci x Unskilled Worker collection with black pants, Gucci sandals and a croc embossed clutch. I was on the fence about the pants but the more I look, the less I mind them. What did you think?